One of the issues that keeps cropping up on this side of the pond is the 25fps/30fps issue with the iPhone. As its “designed in California” the standard frame rate for the iPhone Video Camera (and for iMovie) is 30fps, however in Europe (the PAL area) we use 25frames per second for broadcast. In order to address this issue I adopted FilMicPro as our Video Camera App of choice as it allows you to select 25fps (as well as other frame rates) the next step is to decide how to edit the footage, which I covered in a blog post previously. If you are exporting the footage directly from FilMicPro via iTunes App Sharing and importing into an NLE like Avid or Final Cut then you will have no issue with frame rates as you can set them in the project, though you may have to convert from progressive to interlaced for transmission. If you are editing on the iPhone or iPad however then iMovie, easy as it is to use, has a problem- it is 30fps and there is no way to change the frame rate. On the iPad my preferred editing App has been Pinnacle Studio, an ex-Avid product which is even more powerful than iMovie. The good news is that a few months ago Luma Touch, the company who develop Pinnacle studio for Corel, released a version of Pinnacle studio for iPhone and in the App you can set the frame rate to 25 or 30. Luma Touch have really good tutorials on YouTube so instead of me creating a new one and duplicating their work, I’m embedding them here with permission from Luma Touch. 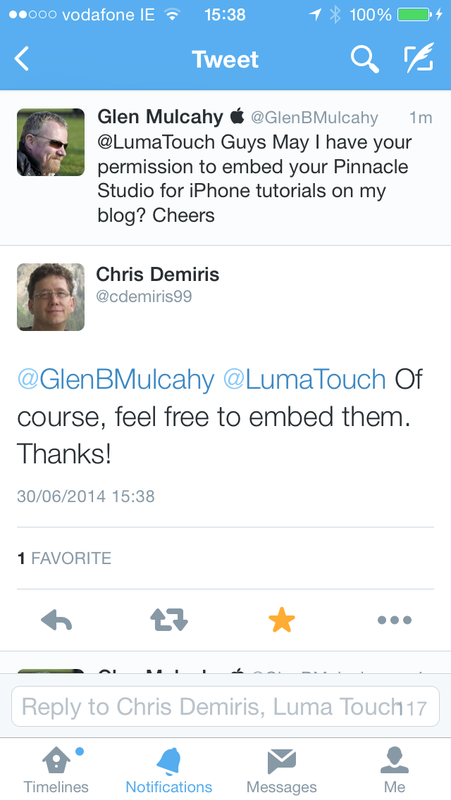 More tutorials from Luma Touch are available on their YouTube Channel and Follow Luma Touch on Twitter for Updates.